Rosa started a foodblog event for Sunday Brunch. She is from Geneva, and her Sunday Brunch table reflects the romantic European style of a brunch. Her table included lovely cheese, fresh bread with butter and other spreads, and cherry tomatoes that looks like I would want to pop one right into my mouth and enjoy the squirt of juice in the middle. My typical Sunday brunch simple and enjoyable too. Breakfast, or weekend brunch is a time to slow down, and enjoy the time. Simplicity for Sunday Brunch or breakfast is the generally the game plan at my house. I love taking time to look at something like Cook's Illustrated, the New York Times, or some magazine I don't have time for during the week. I love sipping on my coffee I get from Bongo Java. Bongo Bob was really the first locally owned coffee shop guy in Nashville to run his business with a conscience. He sells fair trade organic coffee. His stores are designed and run to fit the character of the neighborhoods they are in. The food he sells have a healthy percentage of fresh and vegetarian options, with a good blend of traditional breakfast and lunch foods for the mainstream. Bongo Bob is a good local business owner, he roasts up good coffee beans, and I am more than happy to enjoy the flavor of his coffee every morning. To put in my coffee, I have discovered Rock Spring Dairy, a 35 cow operation which is less than 100 miles from my home. The whole milk is not homogenized, so there is a good rich cream layer on the top. The first few glasses from the bottle tastes like what milk is supposed to taste like. It is rich, nutty, creamy, and heart warming. I have been using this milk in my coffee for 3 weeks now, and it is like a treating myelf to a Cafe au Lait everyday. I ran out right of milk after this photo was taken, and I cannot get anymore until Tuesday after the long weekend Memorial Day holiday. What did I eat a week later? I am still trying to eat as many local ingredients, within reason. I am still drinking local milk because it tastes so much better than industrial milk. I am in love with my Parisian-esque coffee. I have told a few people about my findings, and they are blown away that it is not the coffee bean that makes great Parisian-esque coffee, rather it is the milk. I love cheese, and I found a local cow's milk cheese maker. Ta da! 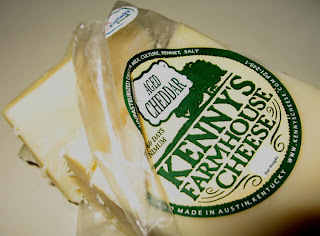 Kenny's Cheese! They use milk straight from the cows they raise in Austin, KY. I am surprised at the variety of cheese Kenny makes. 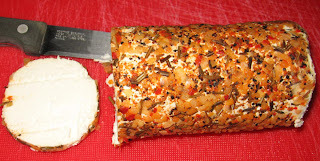 There is aged cheddar, mild cheddar, swiss, gouda, blue gouda, asiago and others. When I went to the opening day of the Nashville Urban Harvest Farmer's Market last week, I picked up some chard, purple broccoli, and some of Kenny's aged cheddar. We were thrilled when we took our first taste of the aged cheddar. The texture was sturdy but not waxy, the flavor was rich, the color was a lovely deep cream, and the cheese had a sharpness that I did not believe a local cheese maker could get. It was very good, and we made the decision to try and use Kenny's cheese as part of our normal cheese drawer item. Last week, I also went to the Nashville Farmer's market to buy my chicken from Freddie Haddox. I have been wanting to write about Freddie and his farm Mamushi Nature Farm. His farming methods go beyond minimum organic growing methods. Freddie strives for spiritual and physical connectiveness to his farm, and he raises his chickens in the most ethical manner. It was an honor to be able to get one of his chickens for my table. The first day, I made an Eat Local baked chicken. I mixed up the remaining bacon lard, a little local butter, local tarragon, local oregano, and garlic in a bowl. I pushed this mixture under the skin to all places I could reach. 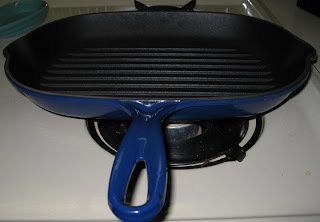 I sliced an onion to put on the bottom of the pan, and I put about 1/2 cup of wine at the bottom of the roasting pan. 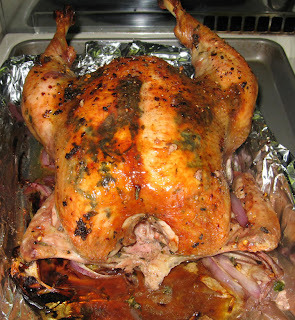 What came out was a chicken with some of the smoky essence of the bacon lard, and a rich umami from the garlic. It was very good. 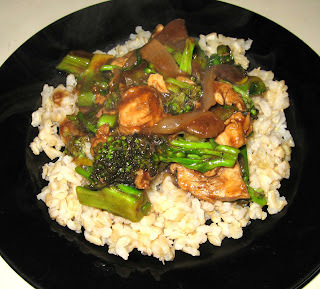 Two days later, I made a chicken and purple broccoli with fermented black bean sauce. I diced up some of the left over chicken meat, and stir fried it up. The sauce is made with real dried fermented black beans, ginger, onion, 1/2 cup wine, a little soy sauce, and garlic. All the stuff boils up with the broccoli, toss in the chicken until hot, and thicken arrowroot. I served it over some brown rice. It was yummy! Last night, we were heading into downtown to grab dinner and a check out some music by Gillian Welch, Dave Rawlings and Bright Eyes at the historic Ryman Auditorium. Dinner, of course, was going to be at Jack's Bar-B-Que because the super secret back door at Jack's leads right to the Ryman's side door where all the stars walk in and out. Jack's for dinner and then a show at the Ryman is a classic pairing in my mind, for many reasons. We have not been to Jack's for dinner since the fall for many reasons. I have been there for lunch a few times since the Fall of 2006, but something has been missing. Jack's Bar-B-Que was one of my favorite downtown Nashville, TN chowdown eateries. Jack's was my favorite bar-b-que, barbeque, bbq, smoky goodness joints, smoked brisket, smoked ribs place in Nashville. I don't care what other people had to say, Jack's was my place for some smoked brisket love. The reasons for loving this food wasn't necessarily the food, the atmosphere, or Bud in a bottle, it was one man Bobby Horton. Bobby Horton, the Pitmaster of all Nashville BBQ pitmasters. When Bobby made the brisket, it was going to be great! Here is how it would go down... I would walk into Jack's, see Bobby standing on the back corner of the room ready to give me the best cut of brisket, and he would say with a big smile, "Hey babydoll how is my girl today? The usual right? I know exactly how to serve it up the way you like it." Then he would proceed to pull out a new brisket from the smoker chamber, trim off all the fat, reserve some of the top black and charry goodness just for me, slice up some of the lean and moist brisket, and then put the black and charry goodness on top. That was the way I like it with that charry goodness, and I am the only customer he did that for. Bobby was the best Bar-B-Que Pitmaster that Jack's has had. He would stay up all night checking the temperatures, making sure the meat did not get too hot because the meat would dry out. He had the gift of knowing the right amount of wood coals, and when to add another hickory log on. He was proud of his work, I was pleased to eat it as often as I could. I liked walking in and seeing Bobby working the "front" because for that moment, no matter what kind of day I was having, all the negatives would melt away, and I knew I would be embrassed by a wonderful, kind, giving and talented spirit in the form of Bobby Horton. The guys at work, when heading down the street to Jack's for lunch, would always want me to go too, and I would be happy to go. They finally told me why they liked me to go to Jack's. They knew that Bobby treated me with extra special goodness, and when I brought people with me, they all got the same treatment, with a little extra brisket or tasty bit on the plate. That was one way Bobby showed me that he recognized me as a loyal customer who appreciated him and the excellence he put forth in his work. One of the last times I saw Bobby was September 2006. Matt and I went in for dinner, and Bobby was working the front of house. He got us the best cuts of brisket and ribs for us to dine on. When he got time to take a break from work, he sat with us, visibly tired from working all day, but with a twinkle in his eye. His daughter had an adobable baby. Bobby pulled out the photo of his new grandbaby, the love of his life, his apple cheeked cutiepie. I may have been the "babydoll" customer, but I know Bobby's grandbaby is the real babydoll of his life. Bobby was so happy to be a grandfather spending his free time babysitting for the baby, and cooing at the baby. Truly, that baby had the best grandfather Nashville could have. That has all slipped away now. Bobby Horton was a strong, fit and hardworking man, but he had diabetes and did not know it. Not too long after the last time I saw him sharing his love over his grandbaby, he slipped into a diabetic coma, and then passed on October 28, 2006. I will miss Bobby Horton, not because of the best bar-b-que he made, but because he was a kind man, and for any given moment when he spoke to me, he could make it seem like any ills in the world were suspended. I want to remember Bobby in that magical moment when he was expressing pure joy while talking about his grandbaby and his growing family while we feasted on his excellent brisket. Bobby, it is not the same without you, and I will miss you. In every healthy living book, workout manual, and or exercise article, there is always some mention of being a conscious eater. I thought I was a conscious eater to an extent by trying to eat whole grains, veggies and fruit everyday. After this week, I think that I had a higher level of conscious eating. Every ingredient we ate was grown or raised in a local, humane and sustainable way. 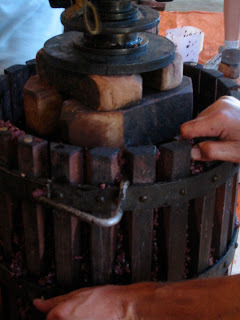 Many of the ingredients were grown or raised organically as well. I ate in a way that was good for the environment, food that was grown from sustainable farms, and food with very little waste. I want to continue to think about my food in these ways. That brings me to the idea of urban gardening. I live in the city limits of Nashville on a very small tract of land with a large shade tree in front, and one in back, and both cover the property with shade and no grow zones. I love my trees because they are old, and provide cool shade in the heat of the summer. If I were to want to grow my own food, I would have find a community garden. 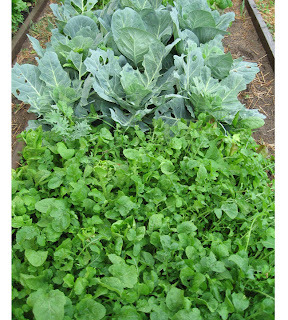 When I lived in Philadelphia, there were community gardens everywhere, and you had to be on a waiting list for a plot. In Nashville, for whatever it is worth, most people don't support community gardens, except for a few very special people. Earth Matters Networks has taken unused land next to an overhead interstate highway, and has transformed it into a community garden, leaf composting center, and gardening education area. 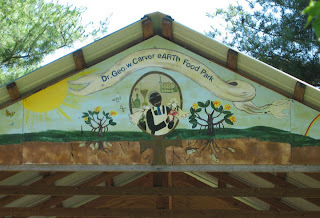 Earth Matters has called this land Dr George Washington Carver Earth Food Park. It is open on Saturdays from early hours in the morning until early afternoon. 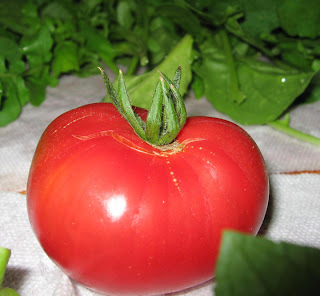 It is fabulous, they plant heirloom tomatoes, heirloom peppers, lettuce, mustard greens, and other veggies. 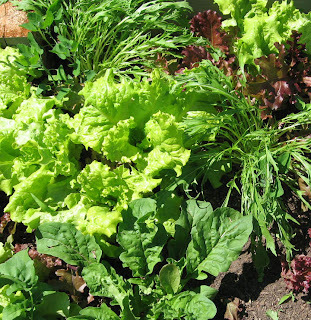 They plant and raise these delicious foods organically. I walked over to the Earth Matters Networks' food park community garden on Sunday, and I happily found it open. The volunteers were getting a couple new beds in shape, and are looking for someone to "adopt a plot". I have lived 3 blocks away from this garden for 5 years now, and I love the idea of it. I support the non-profit organization which tends to the garden, and I find so much value in it. Ok, I have not worked in this garden because I can't seem to get my act together early enough on Saturday mornings to get there and do gardening. As kid, I lived in Los Angeles and Boston with no home gardens, unless you call that hole in the concrete with a stick in it a garden. I just don't know what do with a garden. For 5 years, and especially now, I am thinking about what I am willing to do, and wanting to do, to make my time in the community garden fun, and not just yard work. I love the concept of the community garden so much, but what mental block is getting in my way of actually actively participating more? To participate more, and eat foods from the George Washington Carver Food Park would be the ultimate conscious way of eating. I must continue to think about this wonderful community garden. 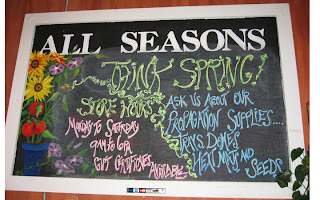 The last day of 7 for eating locally - It is almost over, or is it? What did I eat on Day 7? I went back to the Franklin Farmer's Market this morning for the Strawberries (Delvin Farms) that made my breakfast, and for other veggies to cook up for dinner. I went straight to the Hungry Gnome Farm again because I got awesome bitter greens from them last time, and I want to see what they would have this time. 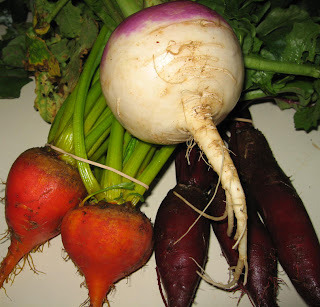 I am so excited, I got Forono Italian red beets, golden beets, a turnip, and kohlrabi to roast up tonight as a side dish to the chicken thigh stirfry with shitake and baby bok choy. We love roasted root veggies made simply with a little olive oil, salt and pepper. Today will be roased root veggies with melted butter and bacon fat with a little salt. What was the rundown for these veggies and strawberries? I really need to thank Cookiecrumb for living a week of eating locally at her house because it inspired me to eat locally at my house. For this experience, I feel like I have emerged from Plato's cave, and I can see things so much more clearly now. I am transformed to seeing the value of seeking locally grown and organic foods for my table. I was reminded what real milk tastes like, what real bacon tastes like, and what real eggs are like. I am interested in keeping these fabulous fresh foods on my table. I cannot wait until the local eggplants come up because I remember the extreme bitter flavor as a child, and I want that again. The industrial eggplants have been GMed so hard that they are just off-white fleshed mushy things without any flavor at all. Before I started this week of eating locally, I had notions of what I thought this week was going to be all about. I thought it was the challenge of staying under budget, can I really eat locally for a week, the hunt for local foods, and supporting local farmers. After Day 1, all of these goals were easily obtainable? Now what is what I thought. Well, the part about, "can I really eat locally for a week?" was weighing so heavily on my mind before I started. I was going through my mind what I would give up because it wasn't on my exemption list with salt, coffee, rice and a little spice. I was scared to give up popcorn, crackers, bread, corn syrup (I too am a gummi bear eater Cookiecrumb), my morning routine of homemade granola and soy milk, bananas, my great imported cheese, and any other snack food. I love the international flavors of spices and ingredients in my home that would have to go on a break for a week. I was addict to all these different foods and my old routine. What the 1st day of this challenge came, I felt like was like the 1st day I gave up Walmart years ago. When I gave up Walmart, I didn't know how I would get along without it. I felt resentful that others were getting better deals than me, other people are wasting less time than me shopping because they only have to go to the big W, and I was I was going to go broke by going to local vendors who sell on a small scale. The psychological hold the big W had on me was tight, and I had withdrawl symptoms and I was irritable. The reality of the matter is that I am not broke, I consume and waste less, I don't shop any more often, I don't have to fight the Walmart parking lot traffic, and I don't have huge volumes of product wasting storage space in my house. For example, the last time I needed nails I spent less time going to my local hardware store (2 mile walk), and less money too. Had I gone to Walmart (20 miles and about 1.5 gallons of gas $4.50 ), I would have had to buy a box of 250 nails for $5, and ended up with an open box of nails wasting space in my house, and no good for any other job than needs nails of a different size. That trip would have cost about $9.50 for those nails. Since I only needed only a few nails, I went to the hardware store and spent $0.12 on exactly what I need. I even got 4 miles round trip of walking exercise (note, this is normal exercise for me as I jog at minimum 3 miles per day, so check with your health professional if you want to start an exercise program) reducing my risk of heart attack, diabetes, and obesity. When I started this challenge, I had the same withdrawl symptoms that I had with giving up the big W. How was I going to get along without the convenience of my local "Big Box" chain grocery store? I was resentful that others were spending way less on meat than I was. That fact is true, but the quality of local, fresh killed chicken, and other meats are so much better, and I only bought exactly what I can eat, rather than buying a giant pre-wrapped pack of industrial meat that may go to waste. The quality of eggs is so much better and fresher. The quality of milk is on a completely higher plane than industrial milk. I was scared that I could not give up corn syrup products because nearly everything has corn syrup in it. I did it, no processed food, not one candy and not one dessert. I was irritated that I could not make a traditional chicken stock because of no local carrots and celery. The reality was that I did make a good chicken stock with local herbs, scallions and country ham to flavor the broth. It tasted different than the tradition stock, but it had a good Middle Tennessee flavor that was heart warming. Who said all chicken stock had to have carrots, celery and onions in it? It doesn't. Day 6 is coming to close, and I did not stray off my Eat Locally Challenge until Dinner. It is Friday, I have cooked and eaten every lunch within the Eat Local plan, every snack I have had has been grown locally, and my beverages were from local sources. It is possible to eat locally, and get all the nutrients you need for a healthy life. People have been eating locally for a long time. People, through the ages, have also sought new flavors in beverages and spices. People have also gone to war over new spices and the spice trade. Can you imagine how happy the Dutch were when they went searching for the new world, and found islands with exotic flavors, and flavors to mask the terrible taste of rotting food, or spice it up to something a bit more interesting than thyme? I mean, years and years, decades and decades of the same old thing would make cumin, and spicy red peppers a welcome for the bored tastebuds. There is nothing wrong with traditional European herb flavors of thyme, parsley, sage and oregano, but for 6 days, breakfast, lunch, snack and dinner, it got a bit tiring. I could not imagine the same flavors for years, or my whole life. SO, it is Friday, I have had a long work week, and I did all the cooking and kitchen cleaning this week. I am a bit bored with the flavors. I am feeling like I need a break from my kitchen, a break from cooking, a break from the same old. I just felt like I had to go out for a litte Vietnamese food. Eat Locally - Part 10 Day 5 - Let's Party! Well, I made it to day 4.5 without cheat eating! WOW! But there is a good reason for the cheating at dinner. Read on my friend. 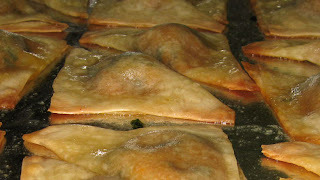 Dinner: a bunch of samosas (see recipe below), and non-local industrial food. Believe me, I really did not need to eat off the Eat Locally plan, but what are you going to do at a party. In the non-fiction book Plenty: One Man, One Woman, and a Raucous Year of Eating Locally, by Alisa Smith and JB Macinnon, they write about eating locally for a whole year. The 1st chapter, they set up the rules, eat locally - within 100 miles of their apartment. They also had exceptions, like lunch meetings at a restaurant, or being invited over to friends for meal or dinner. I agree with those exemptions to the plan. What if they completely shut out the rest of the North America while they did their year long experiment? Then how would their friends and family support them, and learn from their experience? Humans are community oriented in nature, and I think that they did the right thing to bend the rules and allowing themselves to break bread with their neighbors, friends and family. I had a potluck birthday party dinner to go to, and I really had no desire to eat off the Local Grown chuckwagon, but to be polite I ate foreign. What was I going to bring to this party that would not be just baked sweet potatoes or spinach? I had to stray off the path to make this potluck party work for me. 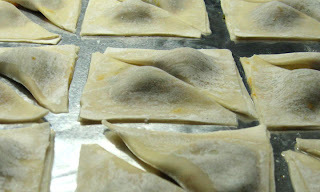 I made mini sweet potato samosas, and I strayed by using wonton skins and canola oil. I was going to brush these puppies with my locally made butter, melted first, but I got really selfish, and wanted to hoard the butter for my own personal consumption because it tastes so good. I have to say that I found a piece of ginger in my freezer that I forgot I had. Last year, I grew ginger in a pot on my back deck, and harvested the root before winter came. I am thrilled to be able to use the ginger in my cooking this week! Eat Locally - Part 9 Day 4 What do I make? Day 4 - Still no cheat eating! Yee Haw! You always hear people say, "Oh my grandma used to cook with butter and lard, drank whole creamy milk straight from the cow, ate bacon and eggs every morning, ate fried in lard chicken every night, and she never weighted more than 120 lbs, and she lived to be 103!" Well, I believe it, sort of. I am living that diet. I too am eating eggs and bacon everyday, cooking in lard (bacon drippings), and drinking whole milk everyday this week. I have even cut back on my jogging to about 2/3s of what I normally run each day just to have that extra 20 - 30 minutes to cook and blog more. I have been eating a meal or snack every 2 - 3 hours. I have lost 3 lbs since the start of this Eat Locally challenge. I could lose a lb or 2 or 20, but I wasn't meaning to lose wt., but it is a fortunate result of Eating Locally. What do I attribute my weight loss to? What I have omitted from my diet is processed flour, sugar, high fructose corn syrup, corn syrup, and all artificial sweeteners because none of those are grown or made locally. I am eating carbs of all kinds though, in the form of brown rice, sweet potatoes, fruits and veggies. I am not on a low carb diet. I think that there is something about processed flour, corn syrup and artificial sweeteners that pack on the pounds. What else? I am eating less, and I know it. But, I am not feeling deprived, nor "panic hungry" that happens when blood sugar falls too low. I think that every food that I have been eating is so packed with flavor and nutrients, that I don't need much more than a small portion to be satisfied. I think the food value of the food I am eating is really high, so my body is not craving more food to fill the nutrient requirements. For example, I think that when I eat a bread made from white flour and sugar, my body may be getting a lot of calories, but it is also looking for nutrients and wholesome goodness. When it doesn't get the nutrients, I will eat more and more to fill the nutrient void. 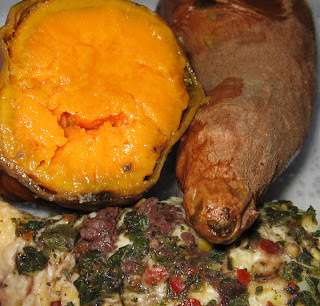 Now, with really good greens and sweet potatoes and meat, I don't crave more because my body is getting nutrient rich foods it needs to thrive. Because I am completely satisfied with what I am eating, I really don't have any inkling to cheat off the foods I have beee making. There is something else. I figured out this week the difference between the hunger feeling, and the feeling of when blood sugar drops low after having a spike of blood sugar after a sweet or white flour snack. I think that the feeling of the 3 pm blood sugar drop is due to previously eaten white flour bread, snacks or corn syrupy soda has been depleted. Then at 3 pm, the sweet snack craving happens to quickly get the blood sugar back up. The 3 pm nosh is part of the cycle where blood sugar is spiked, depleted, craving sugar/white flour, spiked, depleted, craving. It is really hard to stop eating when unhungry because those cravings are not hunger, rather it is part of the sugar cycle. I think that cycle is a very different feeling than just being hungry, when fuel for the body is really needed. At anyrate, since I have taken white flour and sugar completely out of my diet for this week, I have not had that blood sugar cycle, and I have not had that need to feed the sugar cycle. Onward for tomorrow, it is a new challenge. I have been invited to a birthday potluck dinner party. Sigh, I will have to cheat on Eating Locally. BUT, in my back pocket, I will be bringing a nearly locally grown snack... mini sweet potato samosas. Recipe to come tomorrow. I am still on the Eat Locally Plan with no cheating! 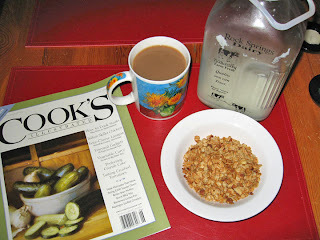 I am a creature of habit when it comes to breakfast, as I usually eat my homemade granola and milk. For this week, substituting rice and a piece of bacon everyday, is a piece of cake. I always eat fruit for a morning snack, and local berries are a treat indeded. At lunch, when I bring my lunch, I usually bring leftovers from the night before. The afternoon snacks are usually more creative, like candy, popcorn, and/or fruit. I haven't missed my usual afternoon snack, and the egg seems to tie me over better than an empty carb like candy or popcorn. The egg certainly does not spike my blood sugar, so I have been feeling fairly good to jog after work for the past 2 days. I hope I feel just as good tomorrow. I am a jogger, and I usually jog during the time that I am now cooking this week. I have had to leave work a little early for 2 days in row to cook, get a meager jog in and get dinner on the table by 8:30 pm. It is definitely time consuming cooking with base ingredients everyday. I would like to continue to use a lot more local ingredients, but I need to be realistic with easier recipes. I like making crockpot foods like chili, but beans are not part of my local foods. I also like making a big giant dinner one night a week, and putting up my own "frozen dinners" for sometime later, like a grab-n-go lunch or desparation meal. To stay within the budget for the week, I did not buy the 2nd chicken because I was afraid of busting the bank. As it turns out, I am still under $100, and I could have gotten more chicken to make a lot more leftovers. Day 2 went very well, and no cheating on the eating non-local foods. Hurray! What did I eat on day 2? Dinner: red Russian kale, Mizuno greens, turnip greens, mustard greens, and fried brown rice with scallion, egg, bacon, and butter. 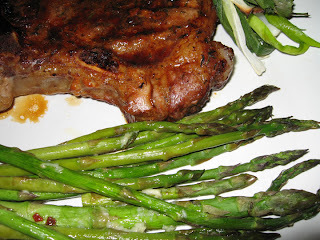 On the menu for tomorrow's dinner: Pork Chops with roasted Asparagus and an Arugula salad with Goat Cheese. What did I learn today? My coffee with real milk is exactly like the coffee I drank in Paris. The first time I really drank coffee was from a Parisian coffee shop for breakfast. I was hooked from then on. There was a quality of the coffee that was so rich, nutty, smooth, and addicting. When I left Paris, I looked for coffee that matched that flavor. I drank and drank and drank. I ground and ground and ground. I spent and spent and spent. Not one coffee bean came close to the Parisian coffee shop coffee. For 25 years, I have been thinking it was the coffee bean, the French press, the toasting or grinding of the bean, the freshness of the toasted bean, or something about the bean. Low and behold, it is the darn MILK. I admit, I get really great coffee beans from a fair trade local roaster Bongo Java, but it is this great local cow milk that makes my cup of coffee like those I had in Paris. stir and cover until done, that could be 1 hour, 2 hours, 3 hours. This recipe is completely southern. 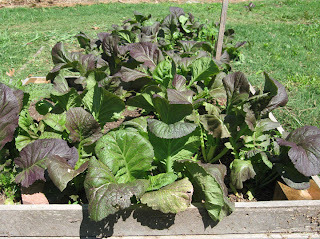 It is not what I grew up with because I am from Los Angeles and then Boston, and we didn't eat too many mustard greens, so when I am cooking them, it is a a little bit of guess work. 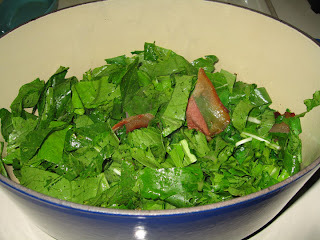 I am really happy to be able to honor the tradition of cooking local bitter greens with locally made ham and bacon. 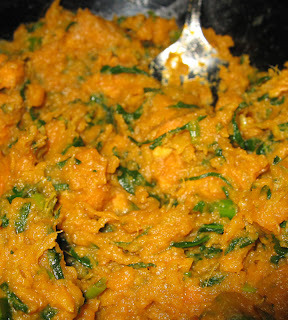 This is what the south lived on for a long time, and it is a cultural dish of the south. Excuse me while I go pour some frozen blueberries in a dish for my evening snack. Yum! Tomorrow I hope to eat only locally again. I usually eat oatmeal or my homemade granola with soymilk for breakfast, but this week, since I opted to do the Eat Locally Challenge, my breakfast had to change to local ingredients. I boiled up a bunch of eggs. My breakfast this week will be made of a hard boiled egg, a cup of rice, and a strip or 2 of bacon. What I noticed about my eggs from Avalon Acres is that they have thicker shells than commercial eggs. The eggs are oval without an air sac because they are fresh, and there was no time from next to plate for significant egg white evaporation. 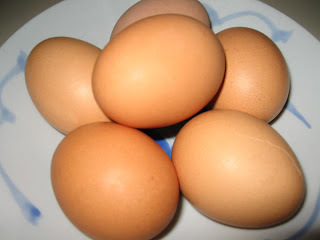 Did you know that eggs only come from unstressed and healthy hens? Well, anyone who has ever gone to a 4-H livestock competition would know that. Then, how do commerical eggeries get eggs with stressed out hens? They starve them for 2 weeks, making super stressed hens, and when they start feeding the hens chicken-chow with melamine again, the stressed out chickens think they aren't stressed anymore due to having chicken-chow. Gross huh? 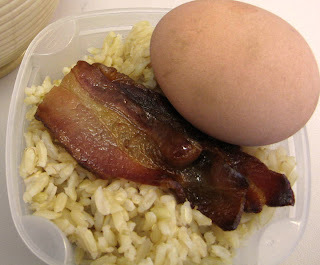 Here is my breakfast, rice, egg and a slice of bacon. Delicious. My locally made bacon has such a lovely REAL Hickory smoked flavor and aroma, I just can only eat one or two pieces. After I am done eating a strip of bacon, I have the hickory smoke aroma in my nose for an hour. I just love that. It is definitely umami, delicious. Commerical bacon with the "hickory smoke flavoring" added could never be like this. I could eat 100 strips of commerical bacon and not be satisfied because there is only fake flavoring and fake aroma made in New Jersey. Now that I have had this bacon, I don't know if I could could back to any commerical brand. Here are my locally grown strawberries, all about the size of a nickel. They are sweet and juicy. I had about 1 cup of berries today for a snack, and I have about 4 cups left for the rest of the work week. I savored each bite because they are so flavorful. 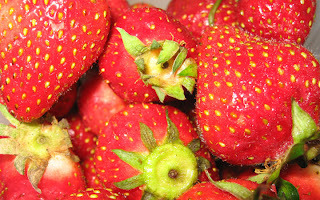 Again, those bulk Florida or California giant berries look pretty, but have terrible texture and no flavor because they were picked green and gased to make them turn pink or red. Again, it is work eating locally and seasonally to get delicous, sweet, tart, and flavorful fruit. Sunday morning, I also broke down my chicken. I think I did fairly well, I got 2 drumsticks, thighs, breasts, and drumettes. I put the thighs up for stir-fry later this week. The rest I baked. I melted 2 tablespoons of bacon lard with a large it of my garden dried oregano and thyme, I added salt and a little crushed red pepper. I smeared on this mixture on the chicken. I poured about 1/2 cup merlot in the pan. I baked the chicken at 350F for 30 minutes. It came out great! The wine herb sauce was a nice addition to the chicken. I also baked my sweet potatoes, cut in half, at the same time. They were eaten plain. It was great meal for the 1st dinner. Day 1 Sunday, was a bit nerve racking because it was a transitional day. We made it through with really good food. Even if I am eating eggs, and bacon, I am not eating very much of it, and I feel a bit healthier than if I were eating conventional foods. I have noticed that everything I am eating has great real flavor, so I need much less of it than when eating chain grocery food. I expect to lose some weight this week, and I will keep you posted. For 2 weeks, I was excited about making the Eat Locally Challenge work for my household. I have relied heavily on a TN Dept of Agriculture website called www.PickTNProducts.org for years now to find local and organic products. Wouldn't you know it, the domain name expired on 26 April 2007 and the website went down, just as I was making my final push for planning. The website came back just 2 days ago, too late for me to really use it for my game plan. All week, I had to rely on the old fashioned way - it was relying on myself and my memory (good luck! oiy), and talking to friends to find out which farms they buy from, and what they may know about the growing season. Get up early (for me) and goto the Frankin Farmer's Market first, and then the Nashville Farmer's Market second. The goal, buy fruit, meat, veggies, and herbs. After blogging about about my cat, I started out at 8:30 am to the Franklin Farmer's market down Franklin Rd, 15 miles. 9 am on a Saturday, some vendors have sold out, and were ready to pack up. Oh crap, how early do I have to get up to make eating locally happen in my house? Everyone who knows us, we are late to rise, late to bed, and we ain't catching no worms. Luckily, there were quite a few vendors and I was able to get quite a few fresh veggies, and the meat for the week. My worry over not finding veggies were put to rest, but here is what challenge cropped up: NO BERRIES! I was thinking that I would be seeing quart after quart of berries, but because of the deep freeze we had a few weeks ago, there were no berries to be had at the Franklin Farmer's Market. I filled my cloth sacks full of veggies, and then jumped into the car to get to the Nashville Farmer's Market. When I got there, I saw 3 small containers of strawberries, and found out they were grown only 20 miles from Nashville. I wheeled and dealed with Smiley, and I have 2 pint containers of berries for the week. These were the only local fruits I could find. I may venture out mid-week to look for more, but I don't think I will find any because of that deep freeze pushing berry crops down the calendar for 2 weeks. Just a side note. I am drinking one of my exempt beverages, coffee, with the local farm fresh milk in it. The milk is not homogenized, so I have a high milk fat content to start off the bottle. The rich buttery flavor of the cream on top is warming my soul. The milk is as sweet as winter hay fed cows, and I suspect the milk will get sweeter as the cows go out to pasture. I remember the sweet and buttery flavor of milk when I was a kid, and I am pleased to have this flavor again. You can't get milk that tastes like this from industrial cows who are fed only cow-chow, and with cow-chow that my have melamine in it. First off, there are a few local farmers in Nashville, but quite a few are after market sellers, and consumers need to be aware. At least when I asked where the food came from, the vendors answered honestly. The stalls that are local were Freddie and his organic chickens, a local Amish group, Smiley's Farm, and 2 other farms. The rest look like a bad day at the chain grocery store. We decided brown rice was it. 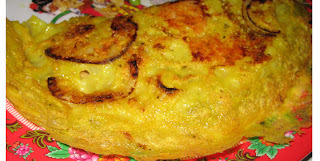 It is the most versatile, and we can eat it for breakfast, lunch and dinner. Other ideas were oats, barley, and wheat flour. 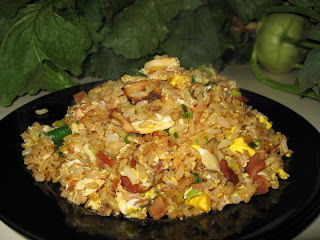 Barley would be ok, but since it not a weekly dish for us, we moved on. Whole wheat flour is too much work for me to create breads and tortillas everyday, NEXT! Rice, we eat weekly, and it is easy to make, BINGO! I went to the Turnip Truck Store and bought about 3.5 lbs of bulk brown rice, or about 0.5 lbs rice per day for 7 days at the cost of $4.60. I got a lot of food, can we eat it all? Will we have a rebate by the end of the week? Probably, as I will most likely not use all the honey, and possibly the pork too. I still think that $152 per week for 2 people for in-house food is a bit much. I think people may exaggerated during the poll for the Bureau of Labor Statistics estimate, and people down played their alcohol consumption to $10. Let's see, it costs about $7-8 to make a bottle of wine on a small scale, and that leaves $3 for perhaps 2 bottles of micro-brew beer. Now tell me, Washington D.C., aren't there movers and shakers going out to talk about business over a drink a couple of days wer week after work? Say $5/day for 2 days, that is $10. What about the wine or beer with dinner for the rest of the week, or the nightcap? Something is fishy about the BLS stats. I have locally grown food around my house. Literally, they are around my house. I have potted organic herbs around the deck and front door to find the sun for them. I bought most of the seedlings last year from the Gardens of Babylon, Farmers Market, 900 8th Ave North, Nashville, TN 615-244-8949 and I raised them with organic fertilizer, and left them to fend for themselves all winter long. These plants are so hearty, that they decided to come back for me. 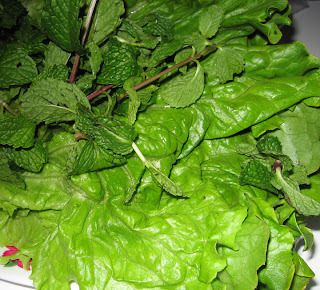 I can use these fresh herbs for my Eat Locally challenge. I also have dried a bunch of herbs this winter, and I will use those too. I have fresh parsley, sage, rosemary and thyme as my potted herbs. Isn't that a song? I still have 2 quarts of blueberries in my freezer. If I can't get local strawberries as my fruit for the week, I will be looking to be creative with the blueberries. Perhaps blueberry rice pudding, or just eating frozen berries like m&ms? Anyway, the berries are from an organic blueberry orchard in my super secret blueberry place in Franklin. I haven't decided if I need to dip into these little blue gems yet, but if I have to dive into them to supplement my fruit intake, I will make sure I add the cost to the tally. 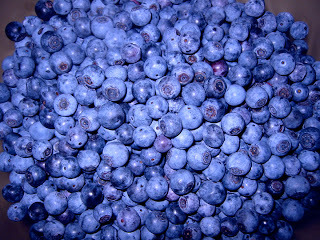 Untiil then, $0, and Franklin Super Secret blueberry orchard is about 20 miles from the center of Nashville. The other things I have at home are honey and wine. 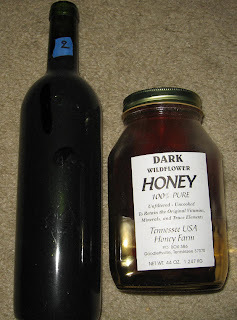 The honey is dark wildflower honey from Goodlettsville, TN. I have about 1/2 quart left and I plan on using that as my sweeting agent instead of sugar. I use it in everything. 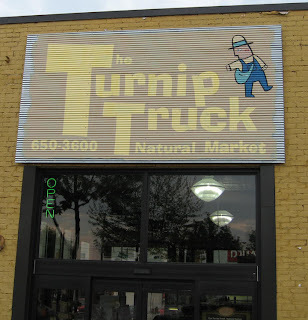 I went over to the other locally owned grocery store after work, the Turnip Truck, 970 Woodland Ave, Nashville, TN 615-650-3600 to find locally grown veggies. I am worried because the April deep freeze pushed the season back 2 weeks, so the optimal time to do this experiment is really May 18, not now. I walk into the store, to the produce isle, and see no locally grown produce. I only see a lot of organic foods. I am in a panic now, and I have visions of us eating just rice like the TV Survivor, and rice isn't even grown locally. I talk to the knowledgeable workers at the Turnip Truck, and told them what I am doing. They looked at me, and said I am 2 weeks too early in this year's season, why not try again in 2 weeks. I sighed. Then the produce people took pity on me, and offered a deal that was so specatular. They offered their own personal garden! Because I was worrying about local veggies being hard to find, I was thinking how I could be creative with finding locally grown veggies. Because I make my own wine from grapes imported from Napa, I have visited a store called All Seasons 3900 Hillsboro Rd, Nashville, TN 615-385-0300 that sells wine and beer making supplies, as well as gardening supplies. I remembered that in the middle of the store they have a hydroponic garden with these big and old tomato plants with lots of tomatoes hanging from them. 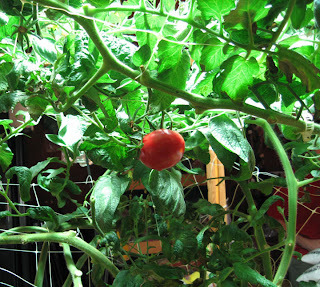 As I walked in straight to the tomatoes, there were not too many hanging. I asked the employees if I could possibly buy some tomatoes, but they kindly said it was a display, and the employees take them and eat them. I sighed, and told them what I was doing. Then, one employee reached in and plucked a tomato for me to have. I am starting to get nervous that I will not be able to find enough locally grown veggies. The middle Tennessee growing season was going along nicely through March, trees and flowers were in bloom, and fragile leaves were just budding. 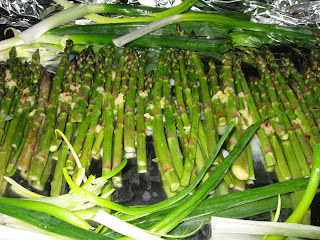 Then, we had a deep freeze for a couple days, and set back the growning season for a few weeks. What normally would have been a great 1st weekend in May for a lot of growers, has been pushed to mid-May. That said, this is what I have done so far. Rock Spring Dairy is in Wildersville, TN, about 85 miles to the west of Nashville. Rock Spring is a small 35 cow dairy, no website that I know of, and they use glass bottles that come with a deposit. The whole milk is pasturized, as per law to sell milk, but it is not homogenized to allow the delicate cream to float to the surface. This is as close to raw cow milk as one can get in the open market. I had raw milk once from my friend Lynn's grandma's farm in NW PA, and there is nothing like the creamy sweet goodness of a free range, grass eating cow. Avalon Acres is in Hohenwald, TN, about 50 miles to the south southwest of Nashville. Avalon Acres is a consumer supported agriculture farm that has both eggs and veggies. I have not bought into the share boxes because I travel a lot, and it does not fit my lifestyle. Plus shares are very large with a lot of food. Since there is no middle man for CSA share boxes, the price is reasonable. Scott Hams in Greenville, KY, about 80 miles to the north of Nashville. They had a product in the Produce Place, and fit into my eat local challenge. I don't know much about these folks, but they are KY State Fair 1st Place winners for their country ham. Sweet Potatoes from Fayetteville, TN are from about 75 miles to the south of Nashville. I was worried about having enough starch and grain products for the week, and I am thrilled that there was a whole bin of sweet potatoes for me to choose from. Bonnie Blue Farm in Waynesboro, TN is about 80 miles to the southwest of Nashville. One blog I read, a running fiend and foodie in Nashville, he talked about a local goat farm with amazing cheese. 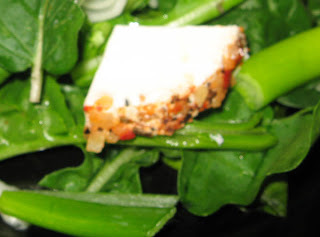 I have been thinking about this goat cheese because I would like to have little dabs of tasty cheese on my salads, or melted over my burger made from a local cow. I could not possibly start the eat local challenge with out cheese. I am so thrilled that there is this tasty treat waiting for me.